It's the time of year that my Meadow Blazing Star (Liatris ligulistylus) start to bloom. Meadow Blazing Star is native to Wisconsin, and it is often found in open fields and prairies. It blooms late summer/early fall and the best part about it is that it is a monarch magnet. 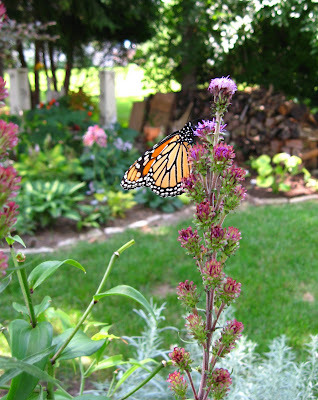 Monarchs and bees are highly attracted to this plant. It is hardy from zone 4 to 9b, which makes this butterfly attractor great for almost any garden. So pretty, I had visitors in my garden today too. Busy day for nature!